The days when you went away for a week and couldn’t get through the door for direct ‘junk’ mail when you got back may be well gone, but Phil Newson, Founder and MD at Burnthebook, believes direct mail in the form of print is making a comeback, although in a more refined and targeted way. Using print as a point of difference in marketing to gain a competitive edge. The shift from print to digital. The drivers for change – nostalgia is the target market. Millennials seem to be the largest group that prefer print to digital. Digital marketing expansion over the years had suppressed print marketing use, but to only mimic its influence of less engagement. Print still holds many unique advantages over overwhelming digital content. Customer data captured by technology nowadays proves to be beneficial to traditional marketing means. Digital and print marketing can complement each other to provide a unique Omni-channel experience. When I started Burnthebook 18 years ago, everyone was saying that publishing and print work were dead, so why on earth would I want to start a creative agency that had print at its very core? Well, I didn’t believe print was dead then and I certainly don’t believe it now. In fact, rather than being an outdated marketing tactic, we are seeing a resurgence in print that will gather even greater pace this coming year - but perhaps not as we have known it in the past. At this point in time, the use of print as part of a marketing strategy, will undoubtedly provide a point of difference and give you a competitive edge. In many ways, the digital revolution created through the accessibility of digital communications was no different to when Johannes Gitenberg, the German Goldsmith, invented the printing press back in the 15th century and brought about the mass production of books, pamphlets and papers. This new and faster way to communicate the written word opened up a whole new world; not only did it provide a method for the rapid dissemination of knowledge, but those who were in trade or business very quickly saw how this new way of communicating opened up markets and helped them to spread news of their products or services much quicker than through word of mouth. To use this new method of print, however, required a trained printer, whereas digital communication can provide easy access to anyone with a computer, allowing them to create their own digital mail shots. The meteoric rise of digital marketing moved marketers away from the traditional printed direct mail pieces to online marketing. Online marketing quickly brought with it many advantages including accessibility, as already mentioned above, and a reduction in costs, since many marketers often decided to no longer draw on the skills of the creative agency and printer. How many times have you seen a poorly written e-shot? Or a dreadful layout? Or (the ultimate sin) images so large they take minutes to load? I think what is happening is that, as consumers, there is so much digital information being sent to us, we are becoming particular and selective about what we choose to read and act upon, and to whom we decide our brand loyalty belongs. So, who or what is it that is going to drive this change? In my opinion, the charge will be led by the Millennials, who seem to prefer print over digital as it satisfies their emotional needs and provides sensory experiences. Being children of the 80s and 90s, this group still remember the time when marketing was dominated by print, so there is a certain nostalgia in receiving a piece of perfectly targeted direct mail that has both a quality feel and captivates them. 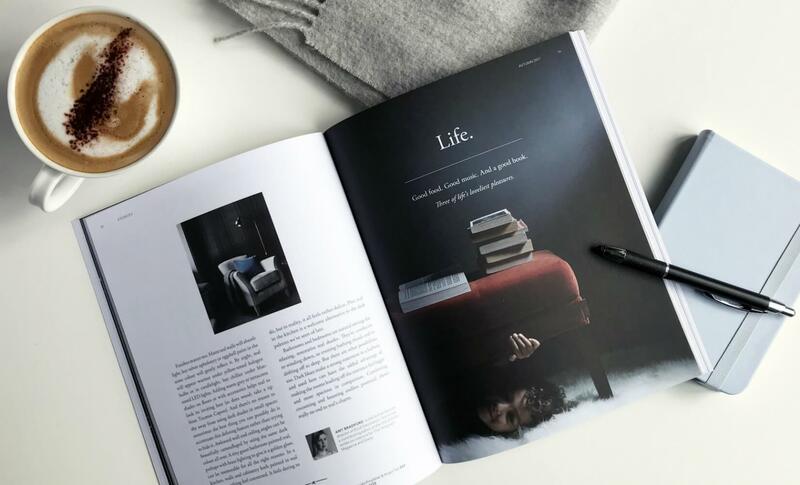 When was the last time you received something through the post that was personalized to you, or had an air of uniqueness about it, and was printed on beautiful paper with fantastic imagery that conjured up a lifestyle that truly appealed to you? I can tell you I received something such as this less than a week ago, when Neptune.com’s latest volume of ‘Stories’ arrived at my home. I challenge anyone who has received something like this not to fawn over it, or at the very least have it preoccupy your mind. This direct mail piece is bang on its target market, and I am sure was costly to produce, but because it’s so targeted, I undoubtedly believe that Neptune will receive a great ROI. I am also sure that this book is unlikely to find its way into a bin. Rather, it will be kept by the majority of recipients, brought out now and again, and influence a sale online or within one of their stores at some point. I might also add that I knew it was coming because they skilfully used social media to hint at its imminent arrival. By the time it arrived on my doorstep, I was eagerly waiting for it. Very clever. So why doesn’t their e-shot have the same effect on me? Simple, their e-shot is fighting with literally hundreds of other unsolicited emails I get daily and, because I am checking emails when I’m busy, it ends up in the Trash, unlike their printed ‘Stories’, which I flick through over a coffee. What this wonderful piece of marketing is also doing, quite stealthily, is developing brand loyalty. This is especially true for my partner, who never misses an opportunity to drag out the latest volume of ‘Stories’ to show to her friends or to back-up her argument for a Neptune purchase. Very clever, once again! So, let’s talk about options. What should we do as businesses when it comes to allocating our marketing budget? We need to get the most from our spend, which means we need to generate new business, keep existing customers and tempt previous customers back. Should we use digital, or print, or both? Online marketing, albeit lower cost, is passive. The email has replaced the steady flow of correspondence, offers, marketing material, bills, etc. that we used to receive through the post. Instead, these are all now sent electronically via email, which means we have an overwhelming number of emails constantly landing in our Inboxes. Most are swiftly deleted, sent to Junk or blocked (just in case the sender tries to send another) without even looking at them. And of course, there is then all of the stuff that we re-directed previously into the Junk folder or has been blocked by spam filters that we never even see. Email marketing has its place and can still be effective, but if it’s to be successful then it needs to be thought through, targeted, and above all a decent investment needs to be made in its creation. In other words, it needs to be created by an agency who know what they’re doing, and not by the new temp or intern who is just brilliant on computers! Not to be completely negative, digital marketing is low-cost and offers more channels to reach the same target audience: mobile websites, banner ads, social media advertising, email advertising and electronic versions of journals, newspapers and magazines are often subscription based at small fees, or even free. What this offers marketers (that print does not offer) is convenience; it’s rapid and delivers real-time engagement with customers. However, the web is filled with lots and lots of content that, in most cases, lacks personalisation, so content gets easily lost amid the digital noise, which usually means it delivers a low-impact. Then, of course, there are the new demons of the internet – the phishing email and the virus riddled email – just waiting to wreak havoc one way or another. We are all so much more cautious of opening anything we don’t recognise the address of, or suspect in any way. A very sad sign of our times, but one that marketers need to take note of and act upon. Can print make a difference and add real value? There is absolutely no doubt that print is considered more expensive and therefore requires a greater investment, but if it’s done well, it can deliver an exceptional ROI. Any Marketing Manager will know how hard it is to prise a budget out of the Finance Director at the best of times, but to put something forward that involves a considered investment, requires a guaranteed ROI. Let’s think of what print can do for us: it’s active and tactile, so it has a higher impact and actually requires you to do something with it. Think of all those magazines, brochures, leaflets and newspapers at home and how long they hang around. How many different people, either living there or perhaps visiting, pick them up, flick through them whilst they are relaxed and maybe something catches their attention, or sparks a conversation? These days, it’s a novelty when the postman delivers something to you. It’s personally addressed in a weighty envelope, clearly not a bill, so what could it be? The postman proves to be more trustworthy, more enduring and doesn’t seem dangerous like the internet, so you’re keen to open it. Someone has been thinking of me and it’s just what I want! How on earth did they know? In an ideal world, a company should look to exploit the best of both digital and print when it comes to marketing or communicating with its audience. Companies should continue to use digital, but it should also tactically consider the use of print to solidify their brand identity and provide a deeper omni-channel brand experience. The amount of customer-captured data available is incredible now due to the many innovative CRM (Customer Relationship Management) systems that most companies now invest in to collect data and sort it meaningfully. This big data helps create customer and buyer personas, which are a critical aspect of target marketing. A marketing campaign that has been thought through, drawing on intelligent data, is far more likely to ensure that high value printed marketing material is delivered to a likely customer and contains the kind of marketing message and call to action that will deliver a result. This is clever and considered marketing at its best. I love the fact that we can print using traditional methods combined with digital print to produce something special and personalised. We can get real value for money using digital printing methods that are so beautiful and hold such clarity that, to be honest, it’s a crime not to utilize this fantastic technology. A story can be told to engage with customers on a more personal level. This is where print and digital are a powerful duo in the making, combining traditional methods like letter press, foiling, stitching with smaller digital print runs to make it all the more achievable within a budget. As we all know, customer engagement is the hot topic of our current digital space. Companies continuously concentrate efforts on making the customer experience more personalised and valuable to make their sales and, more importantly, to retain the targeted customers. Print offers such an engaging and meaningful experience that customers are less likely to forget about your effort, and so you’re well on the way to developing brand loyalty. It’s unlikely that we will ever go back to the volume of printed direct mail that we had in the past because some digital marketing is still relevant and should be maintained. However, this new approach to targeted printed direct mail will undoubtedly deliver quality over quantity. Now is the perfect time to really think about what printed marketing collateral could do for you. This new reformation is only just the beginning. Now is the time to seize the day and capture the customer. User-generated content is more important now than ever in increasing trust and value in customer communities. Bridging the gap between print and digital excites current marketers, provides them with more flexibility to think differently, and to uniquely create alternative ways to provide their audiences with a deeper omni-channel brand experience. I am proud that our combined expertise at Burnthebook enables us to provide high quality digital experiences as well as a wide range of traditional print collateral, such as reports and infographics, for one of our global clients, making us stand apart from many other agencies. The future is even more exciting as new technologies open doors to new innovations, and I’m not talking about just printed QR codes, but paper-thin video adverts combined with traditional print. Therefore, as business owners and marketers, we need to stay ahead of the game by broadening our own horizons, learning to think differently and not being afraid to mix it up when it comes to marketing. We talk about print being traditional, but maybe we should start referring to web as traditional? Due to the digital first approach to marketing that has now been programmed into us, maybe our online experiences are actually more traditional these days. As they say, everything goes in cycles and, from where I’m sitting, print is most definitely making a resurgence.